Witches’ tools The magical working tools in contemporary Witchcraft are associated with the forces of the elements. The tools and their uses are derivative of some Hermetic magical practices (see Hermetica). Before they can be used in Rituals, all magical tools must be consecrated in rites that involve exposure of the tools to the four elements of Nature, by immersing or sprinkling them with salted wAter; passing them through or over a flame; passing them through incense smoke; and touching them with a disk of earth or baked clay, or plunging them into the earth. The consecration rituals are similar to those in The Key of Solomon, a magical grimoire attributed to the legendary king Solomon (see grimoires) and translated into English in 1888, to which Pagan elements have been added. Magical tools customarily are inscribed with runes, sigils and symbols. Ideally, the tools are handmade, for the act of construction helps to imbue them with the Witch’s personal power. Or, tools can be bought and personalized through inscription, consecration and ritual. magical tools serve a variety of purposes in rituals and are used in the consecration of Magic Circles and of other magic tools. A Witch’s personal, magical knife, traditionally double-bladed with a black hilt, and fashioned of steel or iron. The blade may be magnetized. magical knives were said to be used by witches in the middle Ages. According to the Gardnerian tradition, the athame is used only for ritual purposes, such as casting the magic circle, and never for cutting. Other traditions call for using the knife to cast and cut in the belief that its power increases with use. In some rituals, the athame takes on phallic symbolism; it is plunged into a chalice filled with juice or wine, signifying the union of male and female forces (see Great Rite). The athame is associated with the element of fire (in some traditions, with air). In some traditions, it is interchangeable with the sword. Among some hereditary Witches in England, metal is never used in ritual tools because it interferes with energy in the earth. Athame blades are therefore made of flint. Some Witches use a white-hilted knife for cutting and inscribing. knives are never used for sacrifices, which are not condoned. A small dish or container is used to burn incense, herbs, chemicals, wood or other substances, to cleanse and purify the air before rituals. Censing, which represents the element of air, exorcises and keeps unwanted energies away from the magic site; offers sweet air to Goddess and God; raises vibrational rates and summons energies; relaxes the senses; and contains and concentrates power. The formulas used depend on the purpose of the ritual. The burning of incense as protection and offering is an ancient religious practice found around the world. The cup is associated with the female forces in the universe: fertility, beauty, the womb, earth, emotion, love, compassion, receptivity, instinct, intuition and the subconscious mind. It is the receptacle of spiritual forces. It is associated with the element of water. Held upright, the cup is an open womb, ready to receive. Held inverted, it symbolizes birth and realization. The cup holds water or wine, which is consecrated and used in rituals or shared among coveners (see Coven). Symbol of the earth, the pentacle is a disk or square of metal (usually copper or silver), wax, baked clay, earthenware or wood, and is inscribed with Craft symbols. It is generally associated with female energy. 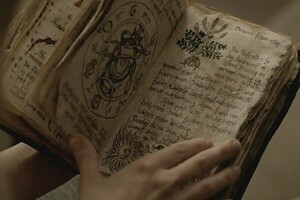 Among its uses are to ground energy and to serve food shared at the end of a coven’s working session. See also Pentacle And Pentagram. Not all Witches use a sword; some covens have a single sword for the entire group. The sword serves the same function as the athame, used for ritual purposes such as casting the circle but not for cutting. It is considered more authoritative than the athame. The sword is associated with the element fire (in some traditions, with air). Gardner made his own swords. The wand is the instrument of invocation of spirits. It represents the element of fire (in some traditions, air) and symbolizes the life-force within the Witch. The wand dates back to prehistoric times and is mentioned in the Bible; both Moses and Aaron use rods to bring the plague to Egypt. The Greek god Hermes is represented with a caduceus, a wand entwined with snakes and winged at the top, a symbol of power, wisdom and healing. Hazel has always been considered the best wood for wands, followed by ash, rowan and willow; 18 inches is considered a good length. The wood should be cut when the moon is waxing or full. In certain Witchcraft rituals, tipped phallic wands are used. Some Witches use wands made of crystal, silver, carved ivory or ebony, and gold. In some cases, a wand may be used to cast magic circles. Some traditions use a cauldron to represent the fifth element of Spirit and the mystic Center. Cords of silk, other natural materials or nylon are used primarily in the Gardnerian and Alexandrian traditions. A single, nine-foot red cord is used in a Witch’s initiation into the Craft (see Initiation). In magic work, cords are knotted by Witches either individually or in a group, while they chant a spell (see knots; spells). The knots are tied in certain patterns or orders and are left tied until the right moment for untying, which releases the magic energy and effects the spell. A system of colors is used for different spells. Cords also are used in binding parts of the body to reduce blood circulation, as a means of achieving an altered state of consciousness in the raising of psychic power. runes, Tarot cards, crystals, the I Ching and other systems of Divination are important working tools. Pagan prayer beads are strands or necklaces of colored beads, each of which represents a different prayer. They are used like meditation beads or a rosary. Light beating with a scourge made of knotted strands of silk or other light materials is done primarily in the Gardnerian and Alexandrian traditions. It was favored by Gardner in Initiations, to symbolize the need to learn through suffering and as a way to raise psychic power and gain “the Sight” (clairvoyance). For the latter purpose, Gardner said scourging excites both body and soul but allows one to retain control over the power raised. The scourging should not be strong enough to break the skin but should be strong enough to draw blood to that part of the body and away from the brain. If done long enough, it induces drowsiness. Scourging has fallen out of favor with many Witches and some covens have abandoned the practice. Others scourge very lightly. Adler, Margot. Drawing Down the Moon. revised ed. New York: Viking, 1986. Crowley, Vivianne. Wicca: The Old Religion in the New Millennium. revised ed. London: Thorsons/Harper Collins, 1996. Farrar, Stewart. What Witches Do: A Modern Coven Revealed. Custer, Wash.: Phoenix Publishing Co., 1983. Starhawk, m. macha Nightmare and the reclaiming Collective. The Pagan Book of Living and Dying. San Francisco: HarperSanFrancisco, 1997. Taken from : The Encyclopedia of Witches, Witchcraft and Wicca – written by Rosemary Ellen Guiley – Copyright © 1989, 1999, 2008 by Visionary Living, Inc.